The face of autism is changing. And more often than we realize, that face is wearing lipstick. 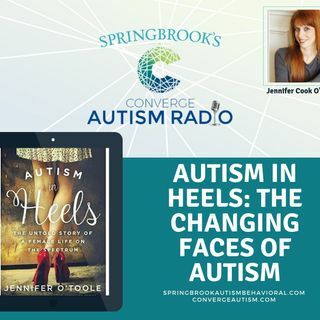 At the age of thirty-five, Jen­nifer Lynn Cook O'Toole, was diagnosed with Asperger's syndrome, and for the first time in her life, things made sense. Now, Jennifer exposes the constant struggle between carefully crafted persona and authentic existence, editing the autism script with wit, candor, passion, and power. Her journey is one of reverse-self-discovery not only as an Aspie but--more ... See More importantly--as a thoroughly modern woman. Beyond being a memoir, Autism in Heels is a love letter to all women. It’s a conversation starter. A game changer. And a firsthand account of what it is to walk in Jennifer's shoes (especially those iconic red stilettos). Whether it's bad perms or body image, sexuality or self-esteem, Jennifer's is as much a human journey as one on the spectrum. Because autism "looks a bit different in pink," most girls and women who fit the profile are not identified, facing years of avoidable anxiety, eating disorders, volatile relationships, self-harm, and stunted independence. Jennifer has been there, too. Autism in Heels takes that message to the mainstream. From her own struggles and self-discovery, she has built an empire of empowerment, inspiring women the world over to realize they aren't mistakes. They are misunderstood miracles.